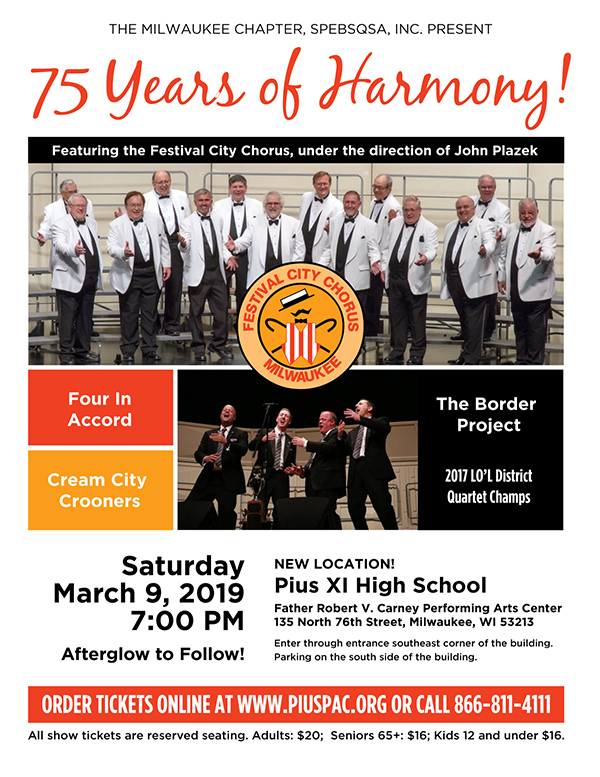 The Milwaukee Chapter of the Barbershop Harmony Society strives to provide a weekly opportunity for its members to experience the joy of ringing barbershop chords in fellowship with their friends, and frequent opportunities to share that joy with others through performance. The chorus meets at 7:30 pm most Tuesdays, click here for more information. Where: Tanino's Restaurant, 3525 S. 76th St. Listen to live barbershop music, and 10% of what you spend is donated to the chorus. Come on out and enjoy some fabulous Italian food and some cocktails too, and hear us sing throughout the evening. Thank you to all who attended our annual show! Thanks to all who attended “75 Years of Harmony”, our annual show in March 2019 - you made it so much fun! We were honored to feature our special guests, The Border Project. The chorus can’t wait to present next year’s show for you. Mark your calendars for our next spring show in March of 2020. Thanks to all of you who supported us by attending and donating at the fundraiser at Tanino’s on May 22nd. We truly appreciate your support and attendance at our event. Thank you to all who attended our spring show! Thanks to all who attended “Dressed To Impress”, our spring show in March 2018 - you made it such fun! 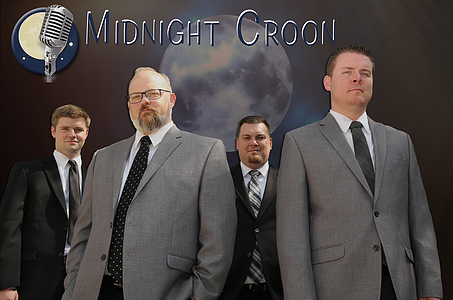 We were honored to feature our special guests, Midnight Croon. The chorus can’t wait to present next year’s show for you. Mark your calendars for our next spring show in March of 2019. ©2016 Milwaukee Chapter, Barbershop Harmony Society. Watermark theme. Powered by Blogger.